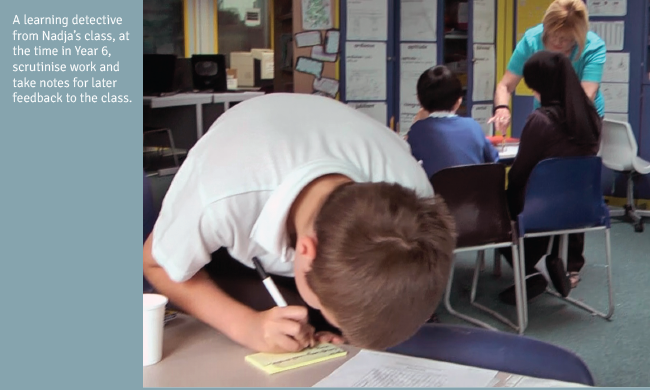 In July, Ann Bridgland talked to Staffroom about her Outstanding Teaching Intervention and how the school used the Pupil Premium to help this practical adventure. I am privileged to be working at Earlsmead Primary School in Harrow with a cohort of five committed, reflective-practitioner and enthusiastic teachers, who are undertaking an Osiris Outstanding Teaching Intervention (OTI) Programme. At the time of writing, we had completed Module 1 of the three modules in the programme. The focus of Module 1 is ‘flow and engagement’. What are the tools and techniques that teachers need to have in their ‘kit’ to create, and sustain, a classroom full of engaged, autonomous and motivated learners? Earlsmead is a larger than average-sized school. Most pupils are from minority ethnic groups, with sizeable groups from Asian, Black African and Black Caribbean backgrounds. Over half of the pupils speak English as an additional language, with about 26 languages other than English being spoken by pupils’ families. traveller families, and some pupils are from an asylum-seeker or refugee background. The school context is important, not least because the Headteacher and the Governing Body decided to use some of the school’s Pupil Premium funding to support the OTI programme. 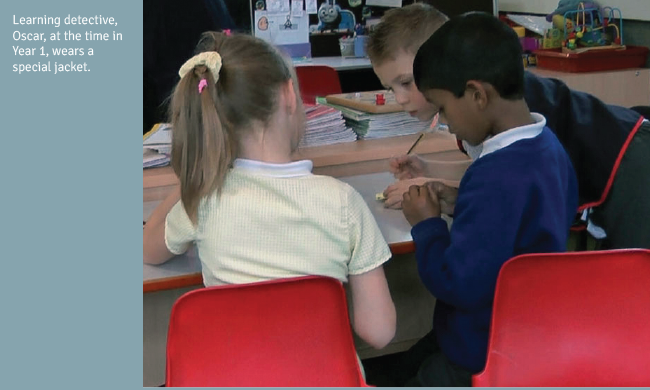 Independent research, published by the DfE in July 20132, shows that four-fifths of secondary schools and more than two-thirds of primary schools introduced or enhanced support for disadvantaged pupils as a direct result of the Pupil Premium. Reflections and reactions from teachers and pupils on the OTI programme to date are already exemplifying the Cambridge research pearls of wisdom: words which have always resonated with me in my career as a teacher, adviser, trainer and consultant. 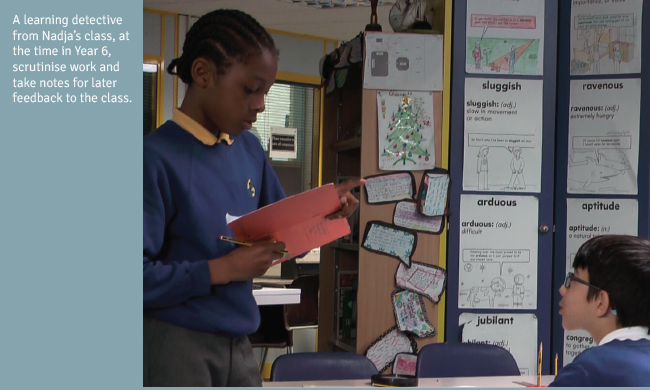 Ossai, teaching Year 1 at the time, reflected on the impact of her OTI work so far when watching the Module 1 video of herself and her pupils in action, experimenting with some of the practical classroom approaches that we have been working on. One of the approaches to pupil engagement that is developing across the OTI cohort is a new take on taking the register. Rather than simply calling out a pupil’s name in expectation of the “present” response, teachers and pupils are rising to a different challenge. For example, by saying their name and describing themselves with an adjective that starts with their name’s first letter, or with a word that describes how they feel about their learning today. “They are fun and I like thinking about different things,” said Siddharth. “They are fun and exciting,” said Gurbuz. “I enjoy them as they are hard,” said Sushant. “I like telling everyone about my favourite colour,” said Denosh. “I like them as they make your brain think!” said Dominic. “They make everyone think!” said Rasa. “I have been trying out the ‘thunks’ and ‘what have you learnt in 8 words’. The children have responded really well. They enjoy the thunks as there is no right or wrong answer and they all get involved. “I think thunks are fun because there are no wrongs or rights and you can express what you think about them,” said Daniel. “I think that they are interesting and that they make children think so that their brains start working,” said Olivia. “I like telling the teacher what I have learnt in 8 words because I use my brain more,” said Puvi. “I like the word challenge at the end because it is more of a challenge!” said Ajancia. “I thought the thunk was very helpful, also it was kind of like a brain quizzer and it had no right or wrong answers. The thunk had weird questions with obvious answers! A key word which is becoming consistently emphasised by the teachers with their new classes this year is ‘because’, important in the development of pupils’ engagement in learning and their ability, independently, to justify and explain their own thinking. What colour would a zebra be if it lost all its stripes? “Red because the blood will show up,” said Nivitha. “White because of the colour of the bones,” said Sushant and Shiloh. “Grey because it will leave grey from mixing black and white together,” said Rasa. “White and red because blood is red and bones are white,” said Riyan and Gurbuz. “Peach because when animals’ fur comes off it is peach colour,” said Ellen. “Blank because there will be no colour,” said Jermaine. Classroom thinking challenges are even infecting the school staffroom! “I like the learning detectives and they always help us,” said Richardo. “I like the learning detectives because they help us when we are learning,” said Oscar. “I like the learning detectives because they make sure children are working,” said Riyan. “I liked when I was (a learning detective) writing notes and asking children questions,” said Dominic. The strategic leadership of the Headteacher at Earlsmead, Emma, is firmly underpinning this significant CPD programme. It is up to Headteachers to decide what interventions to spend Pupil Premium money on, as they are best placed to understand the educational needs of their pupils, in the context of school improvement priorities. “The Governing Body at Earlsmead is keen to secure the best progress for as many children as possible. Improving the quality of teaching is key to this, and Governors agreed to the use of some of the school’s Pupil Premium money for the OTI training,” says Emma. After only a few weeks, it was encouraging for all to see that change was afoot. Since the programme finished in November, it is still rippling! Challenge and support for schools of all kinds are at the heart of Ann’s work. Ann’s specialisms, at the forefront of the latest government policies and of effective classroom practice, include: provision for ‘more able’ pupils; differentiation, questioning, thinking & independent learning; Outstanding teaching; aspiring to leadership. Passionate about stretch, challenge and opportunity for all learners, her training is packed with practical, sustainable techniques that can be implemented immediately. Book Ann Bridgland to work in your school with an Osiris Outstanding Teaching Intervention. Using a range of techniques, assessments and feedback, the OTI is designed to create long-term, measurable changes to teaching. , University of Cambridge, Volume 18, Issue 3, [online]. Available at bit.ly/UoCextract (Accessed 16th October 2013). 2 DfE (2013) Evaluation of Pupil Premium, Department for Education, 2nd July 2013 [online]. Available at bit.ly/DfEPP (Accessed 3rd October 2013).